Enter our 2019 Vegetable Box Competition to encourage children to learn more about growing and eating healthy produce. This competition is open to primary schools in Yorkshire for children in Years 1 to 6. All schools will receive an information pack to assist you in the competition and give you handy hints to successfully grow your produce. This year’s theme is ‘Field to Fork’ which we have chosen so the children taking part can investigate more about where their food comes from. Their learning of this theme can be demonstrated in the decoration of the box, the planting design, the accompanying diary and the presentation to the judges. We ask your group to complete a diary to document their growing journey, this can include photographs, samples of children’s work and recipe ideas, for example. 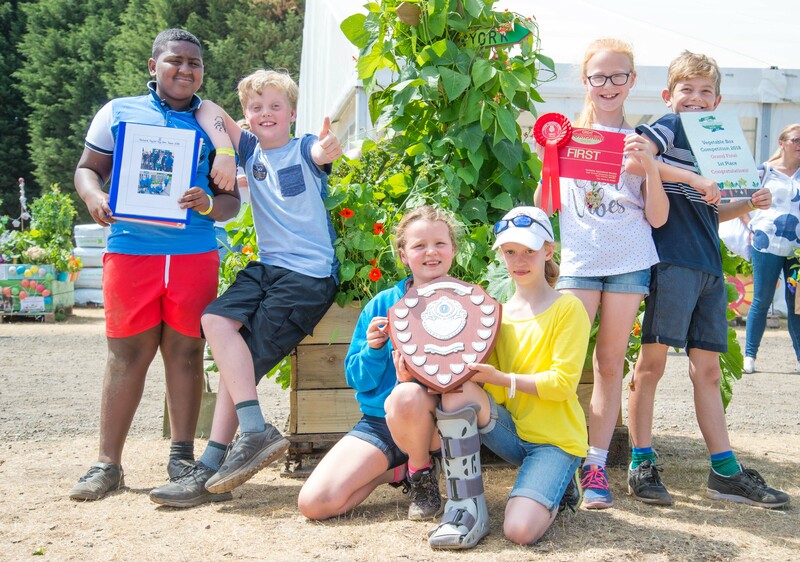 In June we will contact all schools who have entered the competition to arrange for our judging panel to visit your school and judge the diary and Vegetable Box. Following this visit we will let you know if your Vegetable Box has been selected as a finalist to come to the Great Yorkshire Show. We will arrange collection of the finalists’ boxes and bring them to the showground prior to the show, in addition to returning them to school once the show is over. Finalists will receive an allocation of tickets for your group to attend the show on Wednesday 10thJuly 2019 where they will be invited to attend the grand final and present their box to the judges. This will be followed by a special presentation where the winners will be announced. For schools who already have a box, from entering in previous years, there is an entry fee of £15. Please ensure that the box and pallet are in good repair before planting and are sited on solid ground. New schools or schools that need replacement boxes will be charged £30 and will receive a box, pallet and compost, which will be delivered to the school during February. The box must be built in an area that is accessible so the box can be collected and brought to the Great Yorkshire Showground should you be chosen as a finalist. Places are limited and schools will be allocated a place in the competition on a first come first serve basis. If your school is interested in entering this competition please complete and return the entry form as soon as possible. This competition is open to Primary schools across Yorkshire who would be able to attend the Great Yorkshire Show if they are chosen as finalists.